I’ve yet to own a brand new welder. My first one came from Cash Converters (basically a modern day pawn show) as I was a student and poor. And it was not very good! Poor feed system, low quality gun and I replaced the gun liner more times than I can remember. 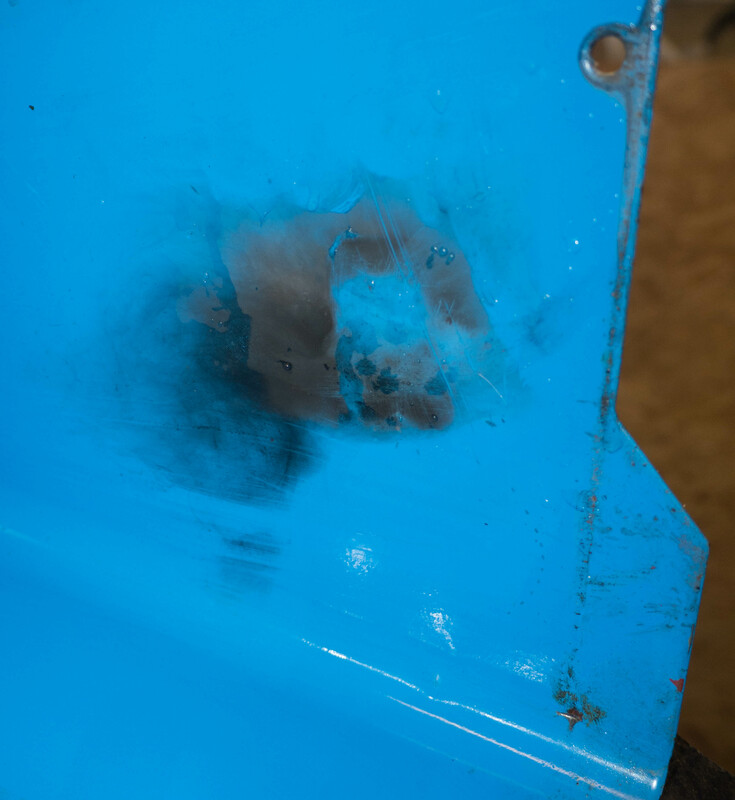 But it did me well when learning to weld. I forget how much I paid but it was not much. A few years later a friend of mine mentioned he had bought a new welder and would I like his old one. Of course! From memory £30 changed hands and I owned a Nu-MIG 155! 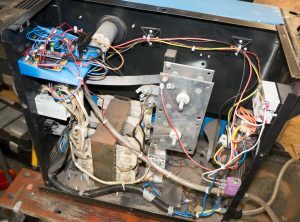 It had a solenoid for the shield gas control so didn’t leak and the feed motor was much smoother. I’ve since run a lot of gas and wire through the Nu-MIG. The last time I used it in anger it was not happy. It wasn’t feeding right, was spitting & splattering and every so often would not stop when the trigger was released. I just had to push on and did some of the worst welding of my life. Thankfully only I know how bad it looked! I put a new gun on it just to be sure and it was no better. So off came the cover. Crap! Something is missing! I think its dead! 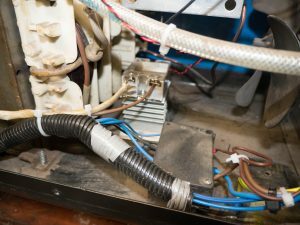 The triac that controls the welding is pop riveted to the heatsink without any compound. And the caps are probably dry and long dead. I’d love a new welder but I’m cheap and I like a challenge! A 2x9V transformer (again from the box of bits) provides 18V AC for the gas solenoid (just visible at the bottom of the pic) and 24V DC for the feed motor. The white box is an ebay 40A solid state relay. 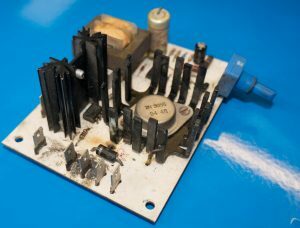 The transformer is powered via a 100A ebay solid state relay sat on a heatsink from the same supplier. Safety cover just because! 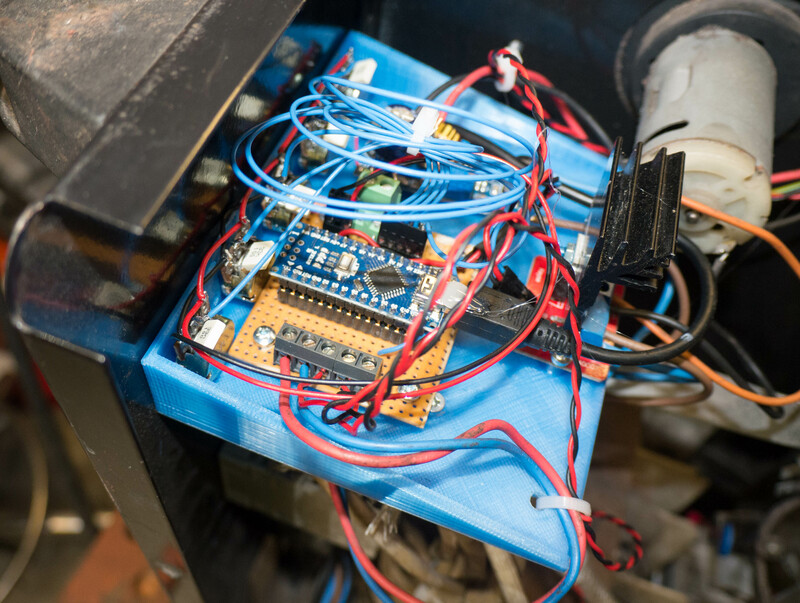 The 10k pots are connected to the analogue pins on the arduino to provide controls such as wire feed speed, burnback control and post gas. I also added a spot weld function. Oh how I will enjoy that! 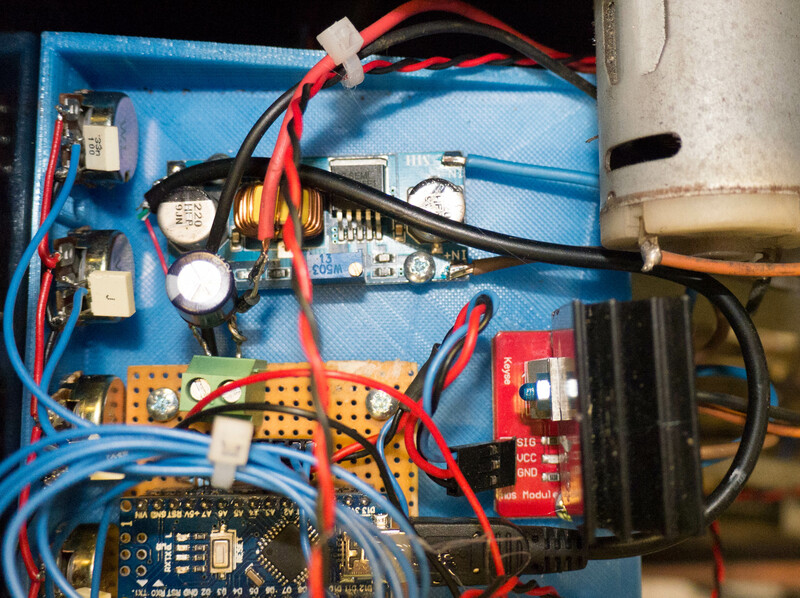 The motor is run from a PWM output using the 16bit counter to give a nice resolution. Total overkill! The trigger goes to a digital input and needs a lot of debouncing! 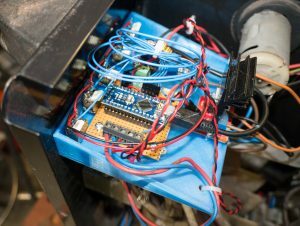 The two solid state relays operate from a minimum of 3V DC so the 5V output from the arduino is perfect to drive them. And they are opto-isolated too. Still lots of space in there. I did make the initial mistake of forgetting to add a safety margin to ebay chinese electronics. I initially used a 40A solid state relay for the transformer control and it lasted 1 test weld before frying. Oops! That is interesting is it failed in a similar way to how the welder was operating before I ripped it to bits. 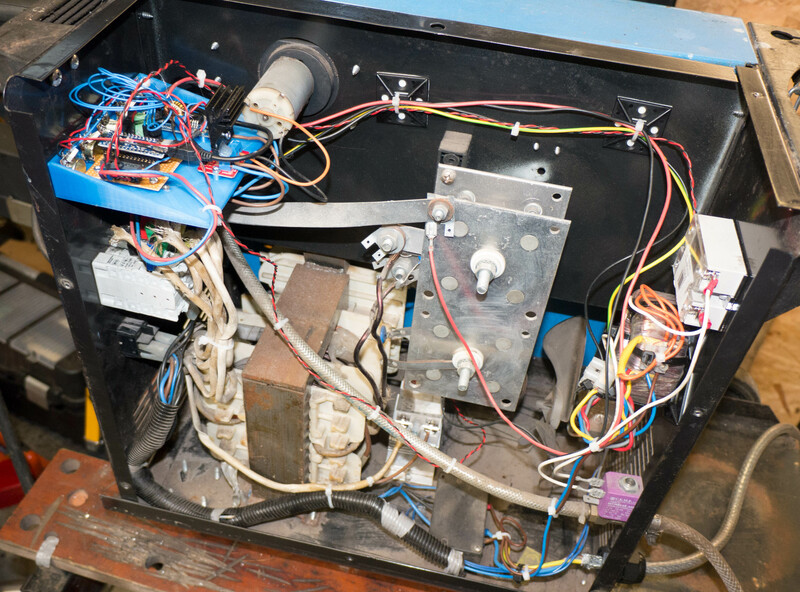 So maybe I could have just replaced the triac and been done with it…. NAH! A 100A solid state relay was the same price as the 40A. So always add in a nice safety margin when shopping on ebay. Slightly crude front panel. A friend is going to make me a nice laser etched overlay to make it look neater. 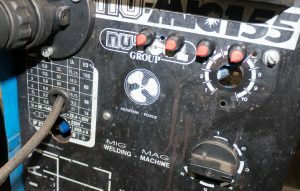 Spot welder timer (knob missing, it rolled under the bench!) 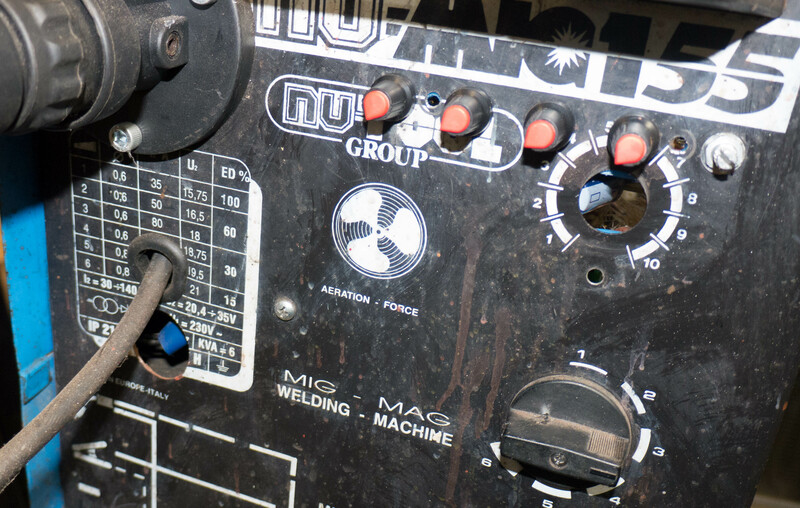 – basically pull the trigger and it will weld for a pre-determined time every weld. And did it work? YES! The feed is smooth and it starts and stops on the button. Phew! The rectifier is fine, the transformer is fine and the gun is still good. 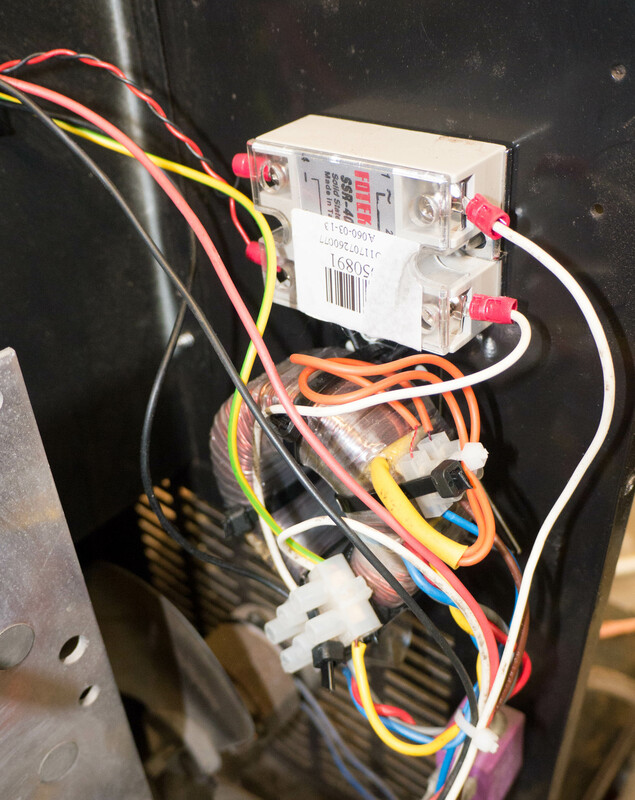 The final feature was to make the wire feed speed dependant on the welding voltage so you can change output voltage (and thus welding current) without having to adjust the wire feed speed every time. To add some protection and smoothing I used (again from the box of bits) a 100uF cap and a 1N4001 rectifier diode. R1 and C1 do the smoothing while R2 and R3 provide protection for the analogue input and divide the voltage by a factor of about 10 so the 45 or so open circuit welding voltage is cut to about 4.5V which is within the 0-5V range of the arduino nano. This needed some tweaking in the code to make work but does work very well. Once I get the overlay fitted and do a little more code tweaking I’ll do an update. The soft start needs fiddling with and the burnback is a little coarse. So it all needs a bit of fettling. 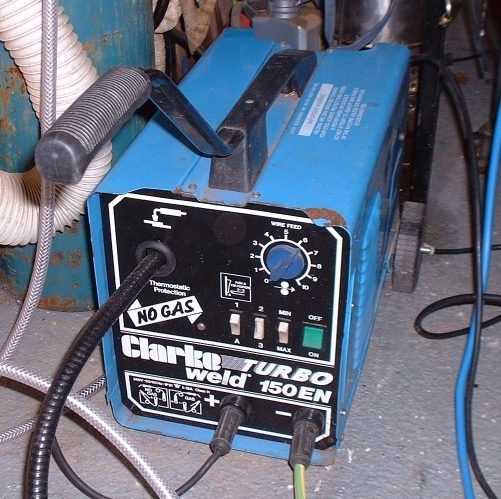 After that I will post the code so you can be silly and make cheap MIG welders better.